I have an obsession with trays of all kinds. If you have been around here for any time, you know that about me. They are very functional, but I think the real reason I love them so much is because they are fun to decorate. I have had this metal tray for a few years. It is great as it is, but I thought it would be fun to share an easy way to change your own metal trays with Chalk Couture. The best part about this project is that it isn’t permanent. You can wipe the design off when you want to make a different one! Let’s be honest. I change my mind and the decor in our home weekly, so discovering a product that helps me be creative, without a ton of effort, and supports my need for change, is something I want to know all about. I used the Chalkology Paste on this project. The paste is not permanent. When I get tired of this design, I will just spritz it with water, wait thirty seconds and wipe it away. AND… I can use the transfers over and over again. I have used many of my transfers over a dozen times! You just need to make sure and clean them well after each use and put them back on the backing they came in and they will be good to go for many uses. 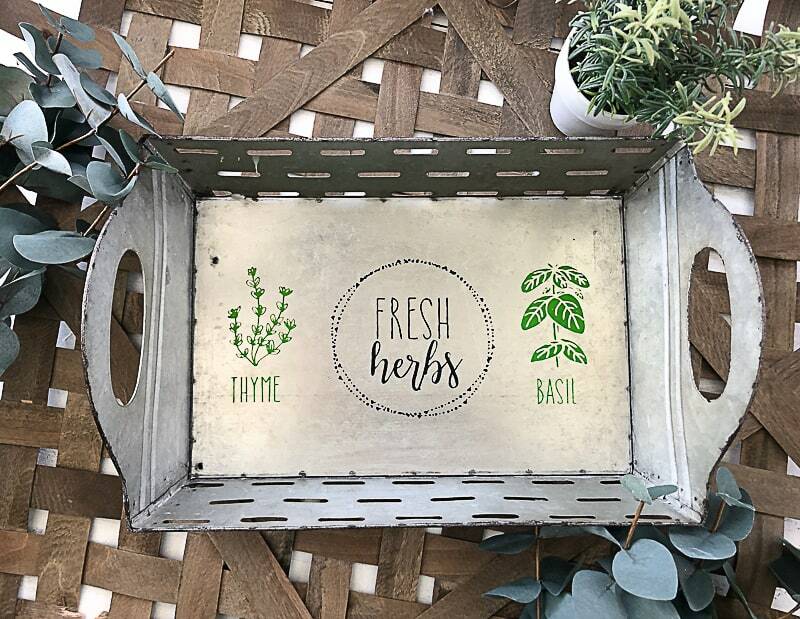 When I saw the “Fresh Herbs” transfer, I couldn’t wait to start creating with it. 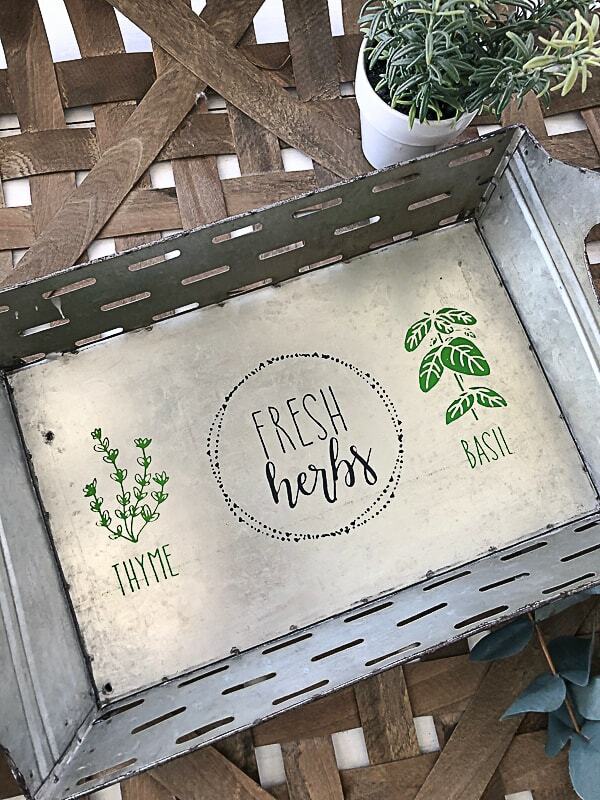 I made easy hanging botanical prints first and then had to add them to this galvanized tray. You can use the Chalkology Paste on so many surfaces and this tray was just calling for a little makeover. In under 10 minutes, it was the perfect tray for spring and summer. Chalk Couture makes it so easy to create one-of-a-kind decor pieces in no time. I am able to create all kinds of things in minutes. I have shared so many different projects that you can find HERE. I am hearing from more and more of you that want to see more projects using the Chalk Couture transfers, Chalkology Paste and Chalk Ink. I hear you loud and clear! I am gathering all kinds of things to chalk with and will be sharing the projects as I do them. What is something you would like to try these products on?